>Coban Rondo waterfall is a beautiful water fall on the slope of Mount Panderman resort that is about 32 km to the west from Malang, it is very interesting to see and visit. The height of waterfall is about 60 meter. Visitor can find and enjoy beautiful panorama ore peaceful impression around the waterfall. Facilities: camping ground, jogging track, fishing or playing with elephants from The Elephants' School Waykambas Lampung - Sumatra. The waterfall is located at Pandesari village, Pujon District (about 32 km away to the West from Malang). 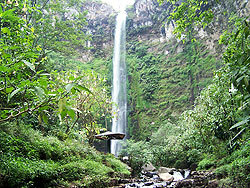 Visit Coban Rondo waterfall tourism and enjoy its nature scenery with its fresh air.